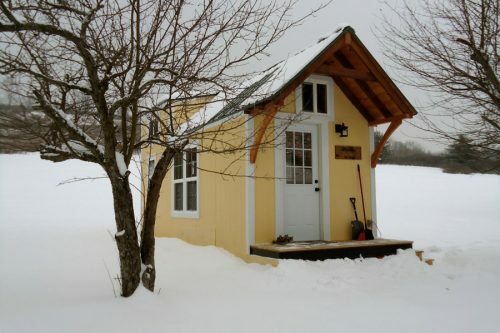 A 240 square feet tiny house with downstairs office, upstairs sleeping loft and living area. Shared by Cherae Stone. More info. here. 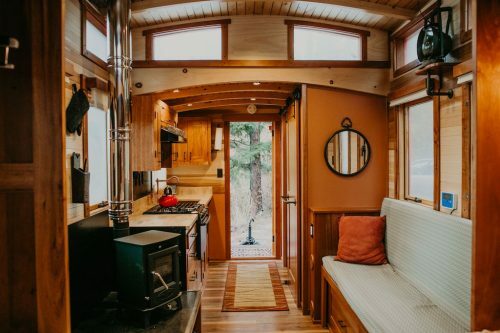 I have been following Tiny House Swoon for a while now. Almost every new one I see takes my breath away and there are features about them that I marvel at. This is the first one I’ve been disappointed in. The rusty tin doesn’t look nostalgic to me. It just looks like nobody cares about maintenance. And I am thinking that if one took a bath with hot water in that bathroom, the condensation would be horrible. And is that sheet vinyl on the kitchen counter? I do like the counter space and cupboards in the kitchen. And I do like having storage space in the bathroom. But that rusty tin…… can’t deal with that! Love the creativity, I have looked at lots of Tiny Houses and love this ones bathtub, rust and fold down kitchen counter/cutting board. I am into the least money spent the better, bravo! It sure does look like sheet vinyl on the kitchen counter top – same stuff that’s on the bathroom floor. I don’t like the rust effect either. It sure wouldn’t be a suitable home in a colder climate. Not the most impressive tiny home I’ve seen. It’s ceramic tile on the countertop. If ya can’t tell the difference between vinyl and ceramic you don’t have the right to criticize others. They was going for the rustic look and I think they did a great job. As for the bathtub if you spray the outside with expanding foam you don’t have to worry about condensation. Fantastic! Love the rustic galvanized exterior! Well… its your your opinion, the western world is (hopefully) still free. There are areas where I too would not like rust. 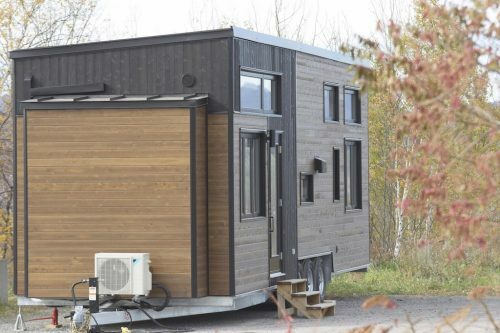 I follow tinyhouseswoon, too, and almost none of the houses is my dream house, but some are really close, I can steal a good idea here and there and improve my dream house more and more. And you will have to admit, that this rusty tin is an honest surface, at least. It does not pretend so be more than it really is. Honest surfaces degrade and age gracefully, showing the age, past usage and some wrinkles, but without becoming ugly. OTOH, glossy , artificial surfaces will become ugly after some time and need to be replaced. In an environment of honest surfaces, man has a chance to age with his environment. In an environment of glossy , artificial surfaces, man will most likely look older and more worn out than his environment. Rusty surfaces can be really nice. Google for “Corten steel”. And you can stop, encapsulate and conserve rust for example with “Fertan” or “Owatrol” (trade names, please google for them, I only get results in german language), so you can have stylish rust, full functionality, and no rusty fingers at all. 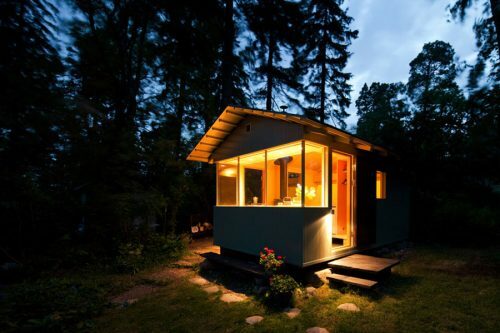 I look at Tiny House Swoon almost daily. I love this house!!!! I love the use of color, the true neatness of the house and the use of every available space!!!!!!!!! This is a wonderful home and I have many more ideas now since I have had the pleasure of viewing it. Thank you for the opportunity!!! As for the comments from Tiny Camper. You are correct, we are all blessed with the right to our own opinions, this one though sounds more to me like a spoiled child who is ticked off because YOU had the forethought and the determination to build that cool bathroom just the way you did!! Personal envy can be nasty. So can people who can’t think of anything nice to say. I love your home. Great, great job!!! Condensation be damned, let the mirror dry and move on. Have a blessed day. But would you walk into somebody’s house and say, “vinyl flooring, blechhh?” This isn’t the comments section of Architectural Digest. It’s a little, personal place for tiny dreaming. For my part, I’m a clapboard girl, but like many elements of this house, includung the tub and chalkboard framed mirror. ‘My humble commode,” LOL. The tree-limb railing, too, and charming hostess smiling through it as well! i always suspected Jay Shafer was once a pup. The first thing I was going to say was that I absolutely love the rusty tin. All those little nooks in the bathroom are genius – making use of every square inch. The stained glass window in the sleeping loft is so charming. And if you look closely, it’s obvious that the countertop in the kitchen is stone tile, NOT sheet vinyl. I love this house! Ummm…. how does one make that gorgeous sitting pillow? I really like this house, and that gorgeous pillow. I love the galvanized tub and am planning on putting one in my single wide mobile home master bath. I am also going to put a glavanized bucket in use for the sink amidst a dresser for the vanity! Great going folks! Love it all! What an inspiration!!! Reuse, repurpose, why not? Old barn tin is the BEST!!! And it’s everywhere in Texas. We pay good money for it to be installed on ceilings, halfway up a wall, as a backsplash… We LOVE old tin. Rust just makes it better!!! 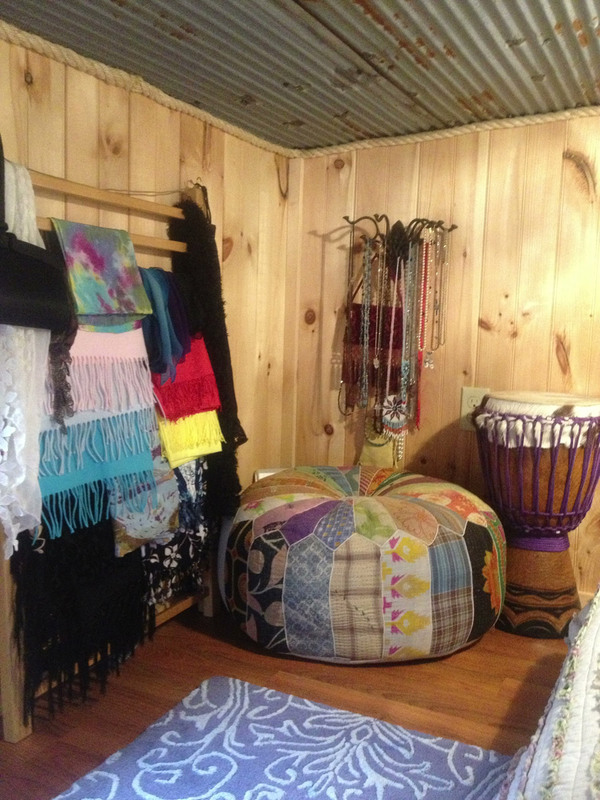 I love the fold down porch roof/storm shutters–and the overall look of rough, scrounged, repurposed materials. I would love to see more pics of the house from the outside–to see the overall size and setting and so on. Also, more to show the lay-out inside. I have a sense of nice details and of the style of the house, but not an overall sense of its layout. 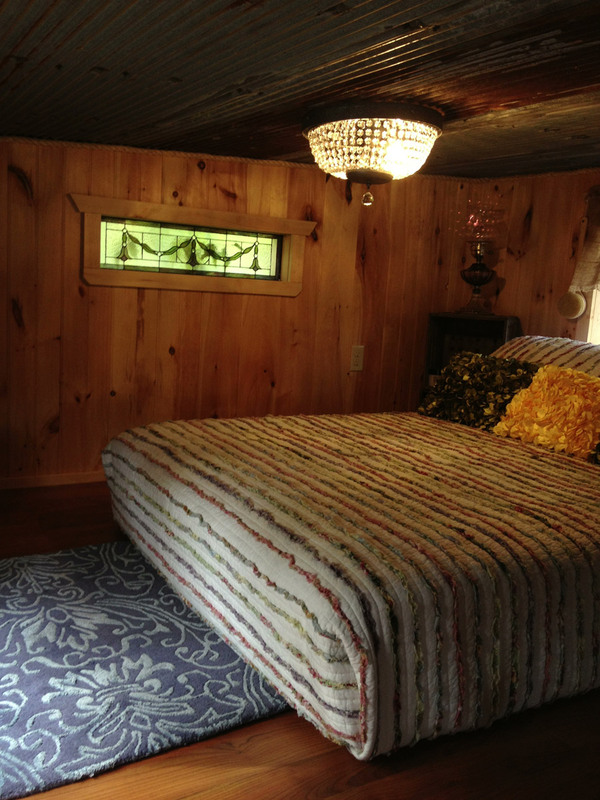 But overall my favorite tiny home, I could actually live in it and be very happy. everything in his house is just about perfect , even the little smile!!!! Odds and ends make sense…must keep looking to see it all!! Thank you for posting!!! Long life and all the love! The aesthetic isn’t my cup of tea at all…however, there is a lot to appreciate about this house. I love the layout (except I’d want to stand downstairs and have the loft upstairs). Great job! love the sleeping area! cozy, yet not too confined. I do have to add that I didn’t get the feeling that ‘tiny camper’ was being jealous, or short sighted, or thoughtless. I felt only a sharing of thoughts -no different than anyone else- that’s what makes the world interesting and keeps the creative juices flowing! Back to the house: I love it! I think the reason I LIKE this so much is it makes home ownership available to anyone. The use of vinyl for the countertop and flooring around the galvanized tub looks nice, no it’s not a millionaire look, but it’s clean and neat. Would be a great way to build a vacation cabin using these ideas too. Not everyone can afford all the bells and whistles! I would rather use actual tile around the tub and on the counter top or maybe a steel rusted and clear coated but lino is something that can be changed as circumstances provide. I like the kitchen and fold down cutting board which I think could be used as an eat at table. Great idea for a house on wheels. Overall I like the rustic look. Is there a bathroom window? Where is the fridge? I love to corrugated steel, so I wanted to know where to get it inexpensively, and people dislike this??? whaaaat? you may not enjoy the style, but why post your displeasure? please, move on to the next and say what you like or something that is helpful…. And we are doing the trough tub for the bath/shower, any pointers you may be able to offer? I’m liking the idea of doing a deck, our’s would have to be a lot smaller than yours. But we too plan on using the corigated metal for the bathroom walls. Rust is a part of a rustic patina to the design, and I like it! As for negativity, inhale/exhale… Love the shower stall/bath idea. Have you any personal experience with a totally wet bathroom? I really think I’d like it… I always dreamed of house cleaning with one big household shower head! 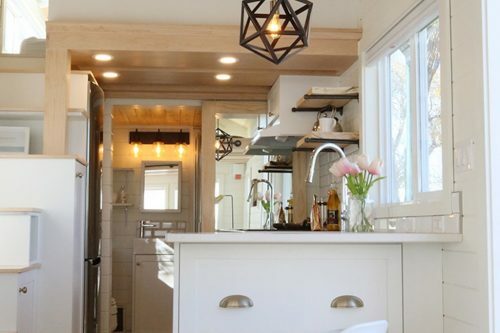 I keep coming back to this tiny house because it has charm and functionality. It has AC/heat which I love. The office space really has grabbed me, although like another commenter, I might want to stand in my office and stoop/crouch/whatever in my bedroom. 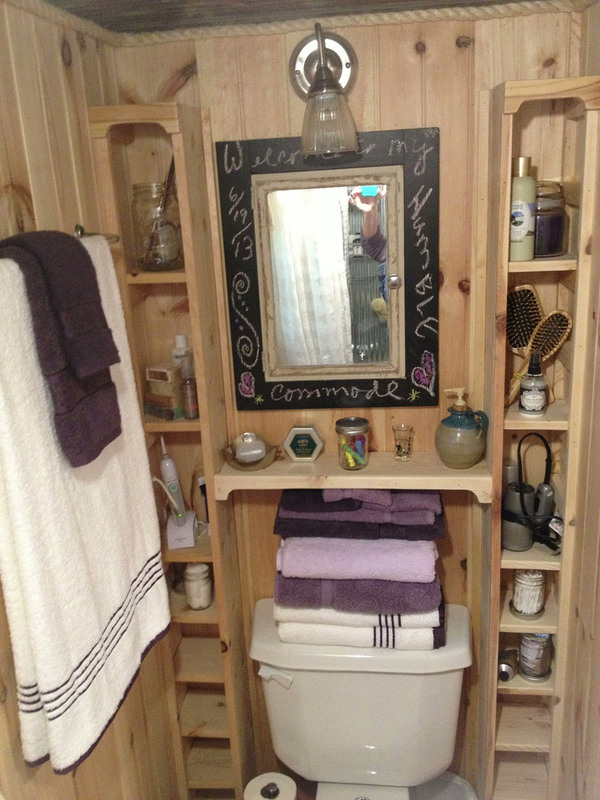 Love the bathroom storage. I’d put a stand up shower in the galvanized tin tub, and a curtain around it. I’m concerned for clothing storage. I’d like to have had a combo washer/dryer too. 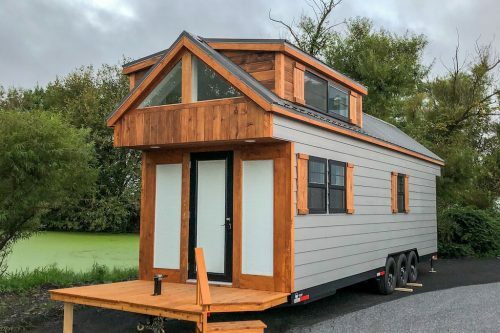 Am I the only Tiny House person, that wants a room at the back of the tiny. Past the bathroom and kitchen, like an extra room…a downstairs bedroom, or a seperate space to chill, unwind….be seperated from other people in the house, or to put the grandbabies down for a nap. Help me!!!! Absolutely stunning and that ROPE TRIM is the most awesome idea of the century! !